Powerful and effective cleaning products. Safe for your family and the environment. Our cleaning products come in concentrated forms designed to save you lots of money on packaging, shipping and the products themselves. Offered in a wide variety of fragrances, Natural Visions will help clean and brighten your home, freshen your laundry, lower your costs and reduce your carbon footprint! Do your part for the planet, switch to Natural Visions brand products today. You owe it to yourself, and the planet! Natural Visions makes going green easy, and saves your money! 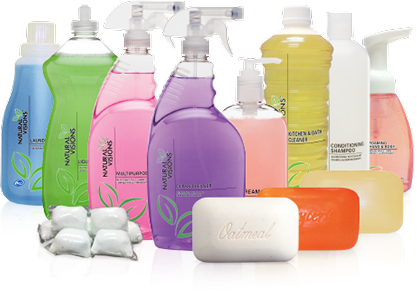 Natural Visions brand products come in a wide array of highly-effective cleaning and personal care products designed to be safer for your family, your pets and the environment. Natural Visions products are never tested on animals. Natural Visions products are created with an average of 90% natural materials. We make judicious decisions when it comes to the ethical use of natural resources, and affordability. All of our products are biodegradable and safe – and natural, when it’s sensible. One of the cornerstones of our company is plastic reduction. Plastic pollution is a ticking time bomb, slowly filling landfills and the ocean. In fact, very little plastic gets recycled. We believe that recycling is not the only answer. That’s why we offer high-quality reusable dispensers that still work efficiently refill after refill. Natural Visions products are created by Liquid Soap Products LTD in the heartland of America, so you can feel good about using products made in the USA.